The state of Durango state finally has its first Magic Town. The small and historic town of Mapimí served various local mines, including San Vicente, Socavón, Sta. Rita, Sta. María, El Carmen, La Soledad, and the presumably traitorous Judas. The indigenous Tepehuan Indians called this place “the rock on the hill” and repeatedly thwarted the attempts of Jesuit missionaries to found a town here, but the thirst for gold won in the end. It is rumored that gold was even found under the town’s streets. A small museum houses mementos and photos from the old days showing just how prosperous this mining town once was. One handbook to gem collecting in Mexico describes Mapimí as the “mineral collector’s capital of Mexico”. This is the place for the geologist in the group to find plenty of inexpensive agates, selenite crystals, calcite and other minerals. Like seemingly every town in this region of Mexico, Mapimí boasts that both Miguel Hidalgo, the Father of Mexican Independence, and Benito Juárez, the President of Indian blood, passed by in the nineteenth century. Juárez even stayed overnight. Access to one of the local mining areas, about 10 km outside the town is via the Ojuela suspension bridge, a masterpiece of engineering. Ruined stone houses on the hillsides tell of Ojuela’s former wealth. Ore was first discovered here in 1598. By 1777, seven haciendas de beneficio (enrichment plants) served thirteen different mines. In 1848, the Spanish mine owners gave up their struggle to make the mines pay and a Mexican company took over. In 1892 they decided to attack the hillside opposite Ojuela. 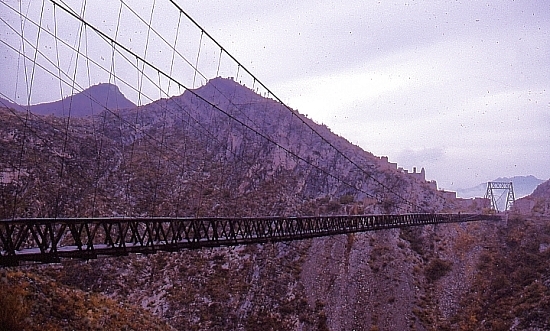 To shortcut the approach, engineer Santiago Minguin spanned the gorge with a 315-meter-long suspension bridge, said by some to be the third longest in Latin America. The mine’s production peaked just after the Mexican Revolution. Between 1922 and 1925, 687 kilograms of gold and 99,820 kilos of silver were extracted, alongside more than 51 million kilos of lead and a million kilos of copper. At that time, some 3000 miners celebrated every evening in the bars of Ojuela, now completely abandoned to the elements. The bridge, restored for its centenary, is a worthy contribution to tourism in Durango state. One and a half meters wide, it sways and bounces in the breeze, probably scaring mums and dads into silent concentration faster than their excited children! But the local miners and their mineral-laden donkeys rattle across the planks as if it were a highway. Once across the bridge, old timers will take you on a one kilometer walk along mine galleries (unlit except for hand-held miners’ lamps) which completely traverse the mountain to emerge into daylight on the far side. Not far from Mapimí is the internationally-famous “Zone of Silence”, the Mapimí Biosphere Reserve, the claimed merits of which are much discussed. Mapimí is a very worthy addition to the Magic Towns list. In a future post, we will look at the merits of six more towns added to the list in the last days of the previous federal administration.